Pauline Ferrand-Prevot escaped serious injury after she crashed heavily while battling for the podium on Sunday in Hoogerheide. Former world cyclocross champion Pauline Ferrand-Prevot (Canyon-SRAM) escaped serious injury on Sunday at the World Cup race in Hoogerheide, the Netherlands after she crashed heavily while battling for the podium. 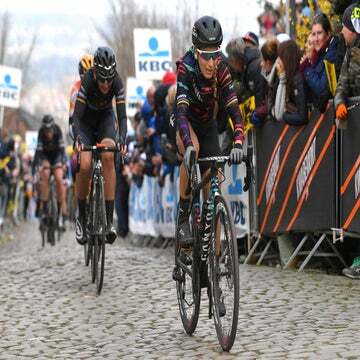 Ferrand-Prevot and Jolanda Neff, who were together behind the two leaders Sanne Cant (Corendon-Circus) and Eva Lechner (Clif Pro Team), collided while riding down a muddy off-camber descent side-by-side. Both riders flipped over their handlebars and hit the ground heavily. Ferrand-Prevot and Neff each lay on the ground in the middle of the race course for many minutes. Race medical staff were quick to attend to the riders. Ferrand-Prevot was by far the worst of the two, as she left the race course on a stretcher and went to a local hospital. She was clutching and being very gentle with her right shoulder, and many feared the worst. The world championships in Valkenburg, the Netherlands are a mere week away. The crash seemed to put Ferrand-Prevot’s start at the world championships very much in doubt. However, the newly crowned French national cyclocross champion wrote on Twitter she did not break anything in the crash and will be on the start line in Valkenburg. Neff left the race course under her own power and after getting up, she even paused and said a few words to Ferrand-Prevot. Unfortunately, Neff will miss world championships on February 3 due to a broken left collarbone and broken right elbow.